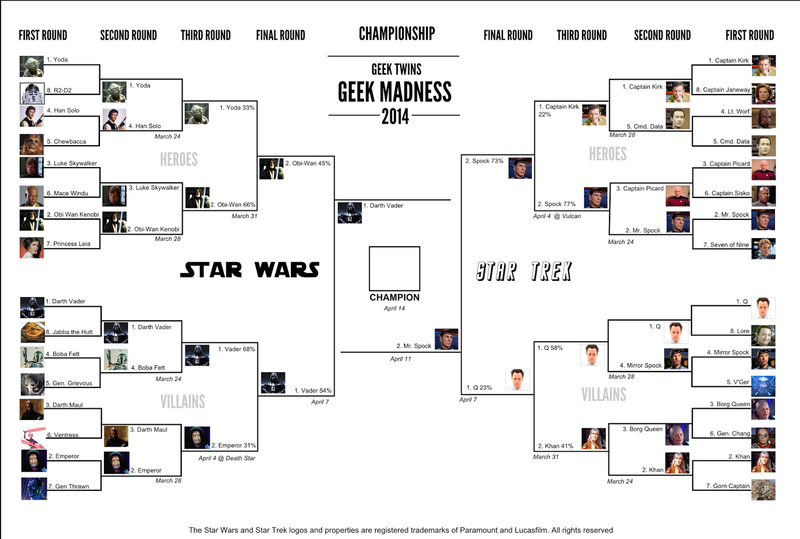 Act now to vote in the March "Geek Madness" Star Trek vs. Star Wars championship tournament! Will Spock go Pon-Farr on Vader? Will Darth Vader force choke Spock? You decide! Welcome to the second annual March Geek Madness Tournament! It's time for the championship round. It's all come down to this. Read this Geek Madness post for all the details on the tournament. The results of the Final Four were interesting because the Obi-Wan vs. Darth Vader fight was really close. You can read the breakdown after the votes. To celebrate the championship round we're doing something special. Predict who you think will win the round and what the score will be and the one who gets closest will win an (1) Amazon gift card worth $5. You can submit up to three entries per email address. The deadline is Saturday April 11, 2014 at 11:59 PM PST. 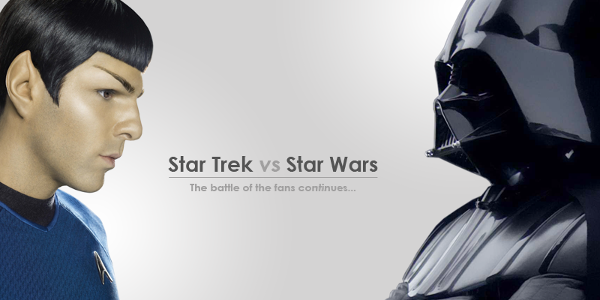 At long last you can vote on whether the best of Star Wars can beat the best of Star Trek. Feel free to say what YOU think happened in the comments. The best play-by-play of the winning match will be used in the next post! Vote now before you forget! Q and Spock stood on the familiar blowing sands of Vulcan. While Spock was no match for Q's power he gave Q a logic puzzle that he couldn't solve forcing him to lose the match. Winner: Spock. Here's the bracket as it stands now. The poll will be closed on Sunday April 13, 2014 at 11:59 PM PST. Come back to see the results on April 14th. They may surprise you! Are you surprised by who's making it into the Championship? Why? Who are you voting for? Why do you think they'll win?